Chris - Sarah Heilbronner is a researcher at Duke University in the US and she been giving chimps and bonobos (an animal related to chimps) a choice between taking a safe bet and being more adventurous. Hello Sarah. Chris - What did you do in your experiments? What did you find? Sarah - We were interested in the execution of decision making strategies and particularly the strategies about risk. As you said we looked to our closest evolutionary relatives, chimpanzees and bonobos, for help. The task that we used has a very intuitive human analogue and so I'll describe that first. If I put you on a gameshow and gave you a choice between what's behind door number 1 and what's behind door number 2 and said that you could keep whatever was behind the door you chose. I'd also told you that behind door number one there was definitely $40 or £40..
Chris - It's a bit of a low-budget gameshow then? Sarah - Well, I never said it was going to be a very exciting gameshow but you've got on it for free so it should be ok.
Chris - And door number 2? Sarah - Door number 2, there's a 50% chance that you'll get $10 and there's a fifty percent chance that you'll get $70. The expected value of door number 2 is the same as the expected value of door number one. As you suggested in your introduction, because you're a human you're gonna prefer door number 1. You're going to prefer the safe bet to the gamble. Chris - Do we know why people tend to be safe betters? Why aren't we more adventurous in our betting? Sarah - This was exactly the type of question we were interested in asking. Instead of asking it about humans we asked it about chimpanzees and bonobos of the great apes. But of course chimpanzees don't regularly work with money nor do they open doors. Instead they were choosing between what's underneath bowl number 1 and what's underneath bowl number 2. We used grapes instead of money. Bowl 1 always covered four grapes. Bowl 2 50% of the time covered one grape and 50% of the time covered 7 grapes. What we found was pretty surprising. The chimpanzees who are our closest relative actually preferred to gamble. They didn't show the same type of preferences as humans. The bonobos were actually very much like humans and they wanted the safe bet as opposed to the gamble. Chris - So the chimpanzees were always being very adventurous. They were taking the high adrenaline option and gambling even though sometimes they got less fruit even if they picked the bowl they knew had just four pieces of fruit under it? Sarah - Exactly. 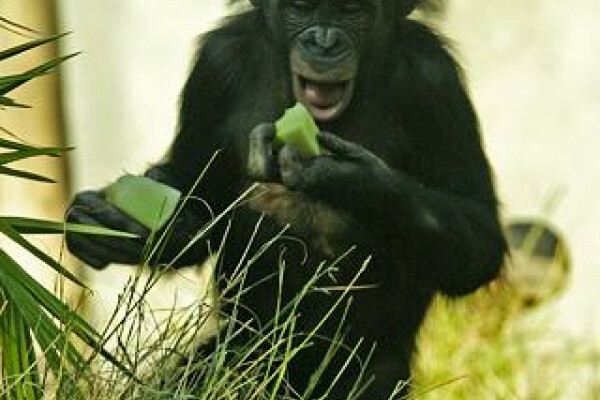 Now over time, chimpanzees and bonobos got the same amount of fruit because they were doing this over and over again. They both had these strong but opposite preferences. Chris - Have you any clue as to why, Sarah? Do you know why they were behaving like that? Sarah - The big question is why. We went back and did some investigation into what they eat in the wild. We were studying captive chimpanzees and bonobos in the zoo but if these chimpanzees and bonobos had been in the wild the chimpanzees would have been taking much more uncertain, much riskier food sources than bonobos. I'll give you a couple of examples. One is that both of them feed on fruit trees but the fruit trees that bonobos are feeding on are much more consistent in their environment and they tend to be larger. They're a much less risky option. An easier one to understand maybe is that chimpanzees are sort of unique in that they hunt colobus monkeys. They go out in big groups and they search for colobus monkeys and they invest a lot of time and energy into doing this. If they manage to bring a colobus monkey down they get a lot of calories. It's a high payoff but high loss possibility there. Chris - What you're saying is that because they have a high-risk lifestyle then evolutionarily speaking they've grown up to gamble which is why they do it even when you put them in an experiment. Sarah - This is exactly right so even when they're in an experimental situation and all the conditions are the same they're still going to maintain the types of preferences that they had back in their evolutionary situation. Chris - So coming back to us, humans for a second, what are the implications for the fact that we are gambling on the stock exchange, we go to the betting, we bet on the Boat Race (Cambridge lost, unfortunately-that's bad news for us). Are we applying the kind of logic that would have guaranteed in our ancestry that we would have filled up the fridge to a modern economy and there's therefore a flaw in how we process our decisions? Sarah - It's a hugely interesting question because much of behavioural economics over the past few decades has shown that humans are not rational actors even though we like to think of ourselves as extremely rational beings. Especially when we're making big decisions about money but these types of results do suggest that actually we are making decisions, at least partially, based on what we faced during our evolutionary history and the most important thing then was not money. Money is a relatively recent invention. The most important thing was food so I think these results suggest even for us, humans, a rational actor (Homo economicus). Even for us, we're probably making decisions based on strategies that were used in our evolutionary path to get food and we might not even be aware of that. Chris - Thank you very much for explaining that to us, Sarah. Basically, put simply, next time you choose a safe bet over a risk you're probably behaving more like a bonobo than a chimp.